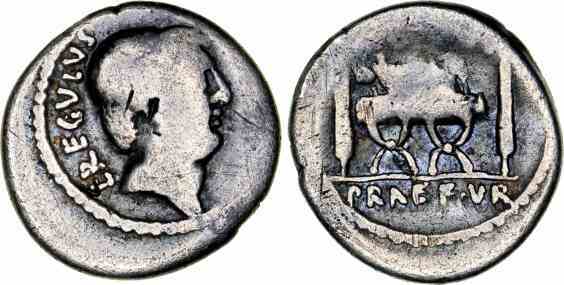 Silver denarius, 18mm, 3.22gm, issued 42 BC. Rome mint. Obv: L REGVULVS PR, Head of the praetor Lucius Livineius Regulus. Rev: REGVLVS F PRAEF VR, Curule chair between two fasces. References: Sear 490, Cr 494/31.